Last year I published an essay called "'Zoothanasia' Is Not Euthanasia: Words Matter" in which I wrote, "Killing animals in zoos because they don't 'figure into breeding plans' is not euthanasia, it's 'zoothanasia', and is a most disturbing and inhumane practice. Using the word 'euthanasia' seems to sanitize the killing at least for some people and makes it more acceptable. While one might argue that many if not all animals in zoos suffer, killing animals who aren't needed isn't mercy killing, it's really a form of premeditated killing." I received a number of very supportive comments and also some that said I was exaggerating the situation and that "zoothanasia" very rarely if ever happens. While I and others would like to believe this, it isn't so as I noted in my earlier essay. 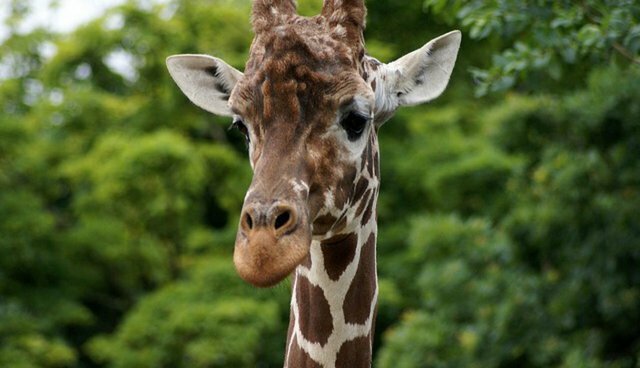 And, just today, I learned that a young male giraffe, Marius, is to be killed at the Copenhagen Zoo because, "The zoo says it cannot keep the animal ... because of European rules to avoid in-breeding, and that attempts to find it a new home have failed." This is not the first case of killing healthy animals at this zoo. This paragraph about the horrific situation brought tears to my eyes: "Marius -- a doe-eyed, perfectly healthy, 18-month-old giraffe -- has been munching in his stall, blissfully unaware that he is about to face his executioner on Sunday, says the BBC's Malcolm Brabant in Copenhagen." Marius will be killed using a bolt gun because a lethal injection would contaminate his meat and he is to be served up to tigers and other carnivores after he is dissected. So, one might argue that Marius will not go to waste, but this is a lame excuse for thoroughly unjustified and unnecessary murder, if you will. I realize that the word "murder" is reserved for human beings but perhaps it's time to use it for such heinous acts as killing healthy nonhuman animals in zoos (and in other venues). Marius is a healthy sentient being and should not be killed as if he is a disposable unfeeling and object. Compassionate conservation (see also) asks us to reflect on the fact that the life of every single individual matters and that no animals should be harmed or killed because they don't fit into a breeding or conservation program. Thoroughly disregarding Marius being alive and well, Bengt Holst, scientific director at the zoo, said, "Marius's genes were already well represented among giraffes at the zoo", as if this justifies killing him. Would you kill your companion dog or another dog (for example) if their genes were already represented in other dogs (which of course they are)? Marius and other caged animals are not objects to be killed when they are no longer needed. They are sentient beings who deserve to live out their lives free of harm in peace and safety and with dignity. Shame on the Copenhagen Zoo. Where's the baby giraffe, mommy? I also imagine what sorts of answers a parent might give to a child when they're asked something like, "Where's that cute baby giraffe who used to be here?" An adult might just say he went "bye-bye" or try to sanitize Marius being killed because he was useless. The honest answer, "Oh, he was killed because the zoo didn't have any use for him because he couldn't breed" might not sit very well with a youngster. And, I wonder what the zoo will do with the income that Marius generated. Marius is not alone in facing this sort of undignified end in a zoo, and I hope people will openly protest this unnecessary and heartless slaughter and that of other beings who find themselves in the same situation.